Five Tibetans including three teenage monks and a young mother have set themselves on fire to protest against Chinese rule over the Himalayan region, according to Tibetan rights groups. At least two of them have died. The five self-immolations – the most ever recorded by Tibetans in one day – came a day before Thursdays start of a week-long Communist party congress in Beijing that will usher in Chinas new political leadership. The three monks set themselves on fire at about 3pm outside a police station in Ngaba county, Sichuan province, while calling for freedom and the return of their exiled spiritual leader the Dalai Lama, according to the non-profit broadcaster Radio Free Asia. One of the monks, 15-year-old Dorje, died at the scene, while the other two – 16-year-olds Dorje Kyab and Samdrub – were taken to a county hospital by security officers. Their current condition is unknown. The London-based group Free Tibet called the incident “the first triple self-immolation protest to happen in Tibet”. About three hours later, a 23-year-old nomadic woman in Rebkong county, Qinghai province, burned herself to death, leaving behind a young son. “Tamdin Tso siphoned petrol from a motorbike and set fire to herself in the familys winter pasture,” Free Tibet reported on its website. “Her body was taken back to the family home where local people gathered to pray.”About 3,000 local Tibetans took to the streets to protest against Chinese rule after the woman died, according to Radio Free Asia. The broadcaster also wrote that a fifth Tibetan self-immolated in the Tibet autonomous regions Nagchu prefecture on Wednesday, but did not provide a name. 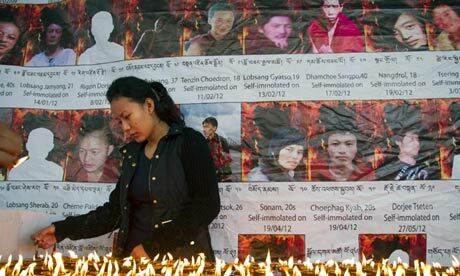 more at Five Tibetans set themselves on fire in protest at Chinese rule | World news | guardian.co.uk. China under spell of Tibetan Buddhism? The leading Chinese Social Sciences division of its government indicated this week that they would be funding a project to create a Tibetan Buddhist dictionary. The dictionary will include terminologies, old books, records, figures and locations all related to Tibetan Buddhism. The dictionary will be available in Tibetan and Chinese. San Francisco will be “blessed” with the presence of Tibetan Buddhist monks, six of them from the Drepung Loseling Phukhang Monastery located in South India. They are coming to perform a religious ritual sand mandala in the Asian Art Museum. They believe it will generate positive effects which will radiate over the whole region by blessing the environment and all living beings. In previous mandala religious rituals Tibetan Buddhist monks have stated that they are paying homage to the god’s of the underworld. There is extensive teaching brought forth by prophet.tv on mandala rituals and the gods that they evoke. For specific information start here at the Building the Warrior Teaching Series. Source article AsiaAlive: Tibetan Sand Mandala Demonstration – Asian Art Museum Calendar, powered by Helios Calendar. Necrotizing Fasciitis (NF) is a rare bacterial infection, which literally eats away at flesh. NF is a drug resistant bacteria, and it can eat away at a persons flesh at a rate of 1 inch per hour. Treatment is in the form of surgery, and a quarter of cases end in death. Although rare, there have been a wave of cases across the south of the country in recent months. Now, one of the victims has died of the disease. Pastor Linda Snyder of the United Methodist Church in Sacramento, died after battling the infection for six months. Another Christian woman, 24 year old Aimee Copeland, of Augusta Georgia has had both hands, her left foot, and her other leg amputated to try and halt the spread of the bacteria. Amiee was infected after she fell off a ripline over the Georgia River. Aimee was the first case of NF in Georgia, most of the other victims have reported becoming infected after being cut in water. In another case a woman developed NF after giving birth to twins, in South Carolina. She has already undergone 11 four surgeries to try and control the spread of the infection. There are now 5 cases in Georgia and South Carolina in recent months, although the authorities say they are unrelated. Interestingly the cases in Georgia have centred around the Centre of Disease Control. Little is known about the NF or how to treat it. In the current spate of cases across the south, are we seeing a manifestation of the demonic that has been release throughout America’s waterways by occult groups, in particular by Tibetan Buddhist rituals?